Someone wise once said that “A heap is made from grains”! Keeping this in mind, we welcome even the smallest contributions from our well-wishers because we believe that nothing goes waste here. Your Contribution, Partnership and Participation can save a soul or a family who are living in dangerous and difficult life threatening situations. Here are a few examples of our heroes who decided to give their best shot to be the reason for someone’s happiness, and they did succeed in it! A Young Flood Rescuer from Doha! 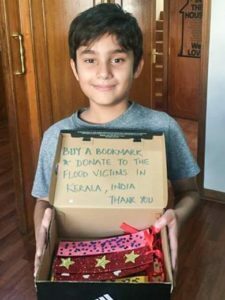 With great pleasure, the Cultural Academy for Peace extends its heartfelt gratitude to young Nathan from Doha, who had the good will to contribute to the flood victims. 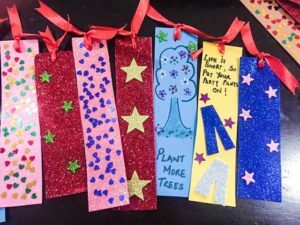 This young boy earned the money by selling these remarkable bookmarks, which he himself designed. His effort moved the hearts of many and inspired many to act like him, regardless of the age! We would also like to thank Nathan’s mother for supporting and encouraging him to carry out such a noble cause. 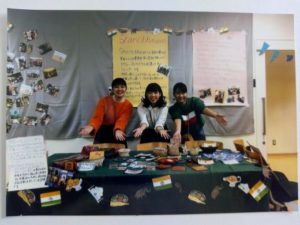 Three wonderful students from the Seisen University, Japan: Miyu Hayashi, Kana Takemura and Natsuki Ando, contributed selflessly from the money they raised at their school festival where they had showcased India! 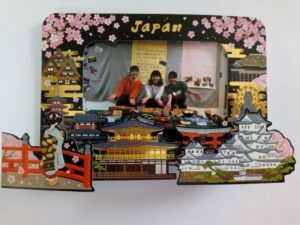 They had visited our rehabilitation center: Shanthibhavan last year in September, after which they were inspired to do something for the residents there.